So there's this thing where people post hex maps up on Google Plus and then others come along and fill in various Hexes to create a complex hex map. Of late Save vs. Total Party Kill has put together a nice little script that prepares these hex collections for display and use in a nice online format. The other night I ended up drawing this hex map below for kicks and posted it. Apparently it didn't inspire, so I ended up filling in most of the hexes and creating the "Gongburg Solitudes" a Fallen Empire sort of small region. "The Gongburg Solitudes are are forsaken hinterland somewhere West of the Capital, South of the Pine Hells and East of the Black Shoals. Forgotten by men a place between others along the decaying Imperial Highway, the Solitudes are officially ungoverned and without significant military force or even patrols. Given their own forgotten and moribund condition, the Solitudes are a fine place to hide from revenge or justice, but like most abandoned baronies of the Empire they are haunted by their past, and secretly rich in once discarded wealth. Marble and wool could make the Solitudes a productive demesne, if they were governed by men and women of sense and vision - something utterly lacking in these fallen times." Well I can't see the stuff you post on G+. Not that I could write anything as inspired as you do. Also the map is really cool. Is that all pen, or are the colors digitally edited? Color balances were yellowed a bit, the base color was white, not beige/parchment - but otherwise all pen. The hex is mightier than the map. 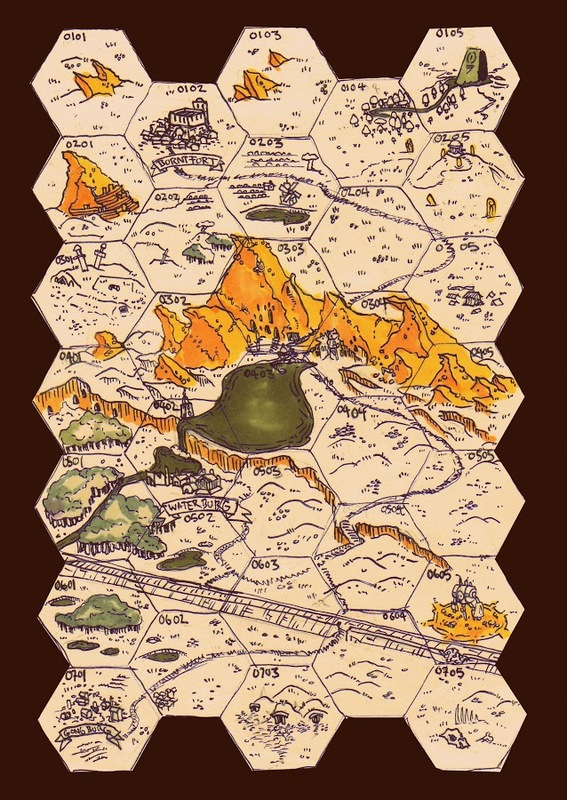 A perennial problem with hex maps? Your hexes are too loud. The near invisible hex is favourite for what hexes are for. I have no real idea what you're talking about. If you go to the linked site you'll see this hex map has been keyed. Keyed so as to be a small region with a set of factions and such. Perhaps a starting area for a casual campaign. Normally for such I'd use a point crawl without hexes - but hex maps are much easier to collaboratively key (which actually allows large hex map creation if you can get enough momentum) which was the point of this exercise. The border is a higher contrast than the map making the periphery the focal 'point'. If you are making a parody of hex maps then it is kind of funny but if you are aiming for cartographic information legibility the actual map information is taking third place in your design. If you don't knock back the weight of the hex periphery and secondly the grid it becomes the dominant subject of the design. If and how you do that is down to which drawing convention you choose to apply and what your initial intentions for what the map is for are.